Who Signed Me Up For This? At a Washington press dinner thirty years ago, fun-loving Washington Redskins running back John Riggins turned to Supreme Court Justice Sandra Day O'Connor and jovially barked, "Lighten up, Sandy, you're too tight!" If there was such a thing as going "viral" in 1985, Riggins' quip went viral. I relate and understand exactly where Mr. Riggins was coming from as I often tell people to lighten up as well. You see, I too love to laugh and have always been considered "Happy-Go-Lucky." In fact, I was nominated to that category in my high school yearbook by my classmates. I am often told that I laugh and/or smile regardless of how bad the situation may be. Yes, I tend to see the humor even in the most morbid of circumstances. So when someone appears tight or heavy burdened to me, I tend to offer the same advice as the former Redskins running back. 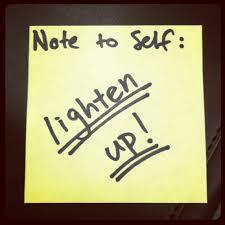 As I was thinking about those words today, it dawned on me that "Lighten Up" could be construed in more than one way. Most often we think of lightening up as taking the weight off or loosening up hence the B part of Mr. Riggins' quip of "you're too tight." In other words, you are too serious or too rigid. But it came to me today that "lighten up" could also be interpreted as one who needs to rid themselves of the darkness that is inside of them. Depression is darkness. Anger is darkness. Fear is darkness. Jealousy is darkness. Bitterness is darkness. Holding a grudge is darkness and this list does not stop here. Psalms 119:105 Your word is a lamp to my feet, and a light to my path. Matthew 5:14 You are the light of the world. A city that is set on an hill cannot be hid. John 1:5 And the light shines in darkness; and the darkness comprehended it not. John 8:12 Then spoke Jesus again to them, saying, I am the light of the world: he that follows me shall not walk in darkness, but shall have the light of life. John 12:35 Then Jesus said to them, Yet a little while is the light with you. Walk while you have the light, lest darkness come on you: for he that walks in darkness knows not where he goes. Ephesians 5:14 Why he said, Awake you that sleep, and arise from the dead, and Christ shall give you light. James 1:17 Every good gift and every perfect gift is from above, and comes down from the Father of lights, with whom is no fickleness, neither shadow of turning. 1 John 1:7 But if we walk in the light, as he is in the light, we have fellowship one with another, and the blood of Jesus Christ his Son cleans us from all sin. So it would behoove all of us to "LIGHTEN UP" in order to bring some light to a dark world that is getting darker. Recent headlines such as Suicide bombing in Nigeria kills 8, Mali hotel attack: Gunmen barged in, shot at 'anything that moved' Cameroon: At least 6 killed in suspected Boko Haram suicide bombings and Paris Terror Attacks illustrate for us just how dark our world is. One common denominator for both definitions of lighten up is laughter and humor. A sense of humor and laughing drives darkness from within as well as loosens up those who are tense, always serious, and rigid. According to a study by psychologists Herbert Lefcourt, of the University of Waterloo, and Rod Martin, Ph.D., now at the University of Western Ontario.Stressed-out folks with a strong sense of humor become less depressed and anxious than those whose sense of humor is less well developed. In this article printed in its entirety appearing on the MAYO CLINIC website we learn the following about laughter/humor and its benefits. When it comes to relieving stress, more giggles and guffaws are just what the doctor ordered. Here's why. Whether you're guiltily guffawing at an episode of "South Park" or quietly giggling at the latest New Yorker cartoon, laughing does you good. Laughter is a great form of stress relief, and that's no joke. A good sense of humor can't cure all ailments, but data are mounting about the positive things laughter can do. Improve your immune system. Negative thoughts manifest into chemical reactions that can affect your body by bringing more stress into your system and decreasing your immunity. In contrast, positive thoughts actually release neuropeptides that help fight stress and potentially more-serious illnesses. Relieve pain. Laughter may ease pain by causing the body to produce its own natural painkillers. Laughter may also break the pain-spasm cycle common to some muscle disorders. Increase personal satisfaction. Laughter can also make it easier to cope with difficult situations. It also helps you connect with other people. 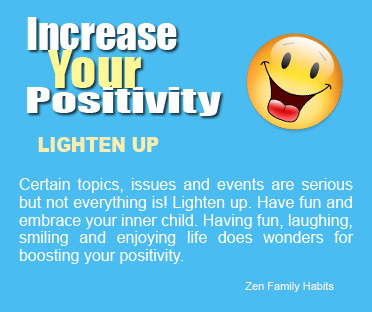 Improve your mood. Many people experience depression, sometimes due to chronic illnesses. Laughter can help lessen your depression and anxiety and make you feel happier. Are you afraid you have an underdeveloped — or nonexistent — funny bone? No problem. Humor can be learned. In fact, developing or refining your sense of humor may be easier than you think. Put humor on your horizon. Find a few simple items, such as photos or comic strips that make you chuckle. Then hang them up at home or in your office. Keep funny movies or comedy albums on hand for when you need an added humor boost. Laugh and the world laughs with you. Find a way to laugh about your own situations and watch your stress begin to fade away. Even if it feels forced at first, practice laughing. It does your body good. Share a laugh. Make it a habit to spend time with friends who make you laugh. And then return the favor by sharing funny stories or jokes with those around you. Knock-knock. Browse through your local bookstore or library's selection of joke books and get a few rib ticklers in your repertoire that you can share with friends. Know what isn't funny. Don't laugh at the expense of others. Some forms of humor aren't appropriate. Use your best judgment to discern a good joke from a bad, or hurtful, one. Go ahead and give it a try. Turn the corners of your mouth up into a smile and then give a laugh, even if it feels a little forced. Once you've had your chuckle, take stock of how you're feeling. Are your muscles a little less tense? Do you feel more relaxed or buoyant? That's the natural wonder of laughing at work. So let's all follow the advice offered by John Riggins 30 years ago and "Lighten Up" in both senses of the phrase. Let's unburden ourselves with some things that we can let go of. Let's not be so tight and rigid because at the end of the day, it really is not that serious. We must also free ourselves of emotions such as depression to rid the darkness inside of us so that we can be light bearers in the world. If you are a light, when you walk in a room, everyone will know it. When you are making life better for someone else, you are being a light. When you are just fun to be around, you are being a light. Reiterating Dr. King's quote, "Darkness cannot drive out darkness: only light can do that." Let's go out there and be some light. Something to critically think about. You are invited to join me live each Saturday at 6:00 a.m. ET on gobrave.org and in northern NJ on FM radio WP88.7 FM. You are also invited to follow me on Twitter @thinkcritical01 and readingcircle01. I begin this post by saying this is one of the longest stretches of time between posts (August 16 - November 11) since I began The Critical Thinker some years ago . I guess one could say I just have not been in the mood for writing because certainly there is more than enough to write for us to critically think about. I feel as if The Critical Thinker has been missing in action. Educators reading this will agree that we all have humorous stories based on situations occurring with our students, families, and colleagues that range from the sublime to the ridiculous. Teachers and administrators commonly lament that at the end of their careers they could write a book, and those sentiments are true. As we meet with each other, we share stories about what has happened in our classrooms and in our buildings that in some instances seem unbelievable but are indeed true. While many of the stories are humorous or horrifying, they also in some instances contain a bigger life lesson embedded within. With all of that said, I'm sharing one of these stories with you that for me has a life lesson interpretation within it. This story always brings a hearty laugh between me and my colleague Nancy when we reference it with each other. In fact, the question appearing in the title of this post has become a code between me and Nancy when something is said or done in our business that does not make sense (Shhh...that's our little secret). The story goes like this...... there was a student who was as cute as they come; however, he could be as troublesome as he was cute. Each year our school was the recipient of toys donated by a magnanimous organization who visited our school with Santa Claus. The generous donors would solicit the name of each child and some possible ideas as to what toys to bring. This would happen as early as September or October. Throughout the months leading up to the Christmas holidays, teachers would constantly remind their students about the Santa Claus visit and how their behavior could impact what gifts they received from him. The old story about the lump of coal was shared repeatedly with the students particularly those who chose not to follow the rules and our little handsome friend heard this story probably more than most; however, he chose to ignore the warnings. One day after experiencing the actions of this student, his teacher came to me and said I know how to help this student understand the connection between his actions and consequences and the lesson will be learned when Santa Claus is here. Well, the big day arrived! All of the lower grade students were brought into a large room in the school that had been decorated with colorful lights, tinsel, a Christmas tree and gorgeously decorated gifts. In the center of it all was the big Santa Claus chair with Santa Claus seated in it. As the children entered the room their eyes widened, their smiles broadened, and their squeals heightened. Excitement was in the air! Each teacher lined his/her class up alongside the Santa chair and each child to his/her delight spoke with the jolly white bearded man one by one. At the end of each conversation, Santa Claus gave the child a gift which ranged from a bicycle, video game, board game, doll, skateboard, to a deck of cards. If you have read this far, I am sure you have figured out which gift our little friend received. After each class received their gifts, they were asked to assemble for a group picture. As our little friend’s class grouped to take their picture, the children stood proudly with their gifts with the exception of our little friend. 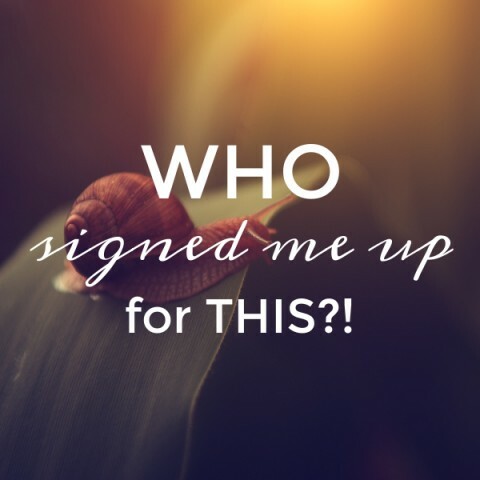 With a slight stutter he turned and asked the question, "Who, who signed me up for this?" The teacher looked at me with the smile of a Cheshire Cat and as our eyes met, I knew the answer to the young man's question. I share this story because oftentimes in life, we also ask "Who signed me up for this?," not realizing that it was our own choices and decisions that brought us whatever we received causing us to ask that question.and others such as "Why the heck am I experiencing THIS in my life?," or "Why ME? Why NOW? Why THIS?" I'm sure we have all said, "What? You've GOT to be kidding!" Just like the student whose behavior caused the teacher to select the deck of cards for him compared with a bicycle for one of his classmates, our choices bring about our outcomes. We reap what we sow and this student reaped a deck of cards for what his behavior had sewn from September through December. I love metaphors and parables as they contain meanings beyond the surface. As things get challenging for me and Nancy as we lead our respective schools, we will look at each other in meetings and laugh as we both say "Who signed me up for this?" In the final analysis, the truth of the matter is, we sign ourselves up for whatever we receive based on our choices and decisions. We must ask ourselves what am I sowing? And once we have honestly answered that question for ourselves, we must then choose wisely. Something to critically think about. I invite you to join me live each Saturday at 6:00 a.m. Eastern time on gobrave.org and WP88.7 FM as host of The Reading Circle with Marc Medley. You are also invited to follow me on Twitter @thinkcritical01 and @readingcircle01. Lastly, follow me on YouTube and download The Reading Circle mobile app on Itunes or Google.